Robert A. Salerno attended Law School and received a B.S. from High Point University in 2005 and his Juris Doctor in 2009 from Touro Law Center. He was admitted to the Connecticut Bar in 2009 and was a Temporary Assistant Clerk working closely with judges in the Waterbury Judicial District for two and a half years before joining The Law Offices of Conti & Levy. He is a member of the American Bar Association, Connecticut Bar Association; Criminal Law and Young Lawyers Section. 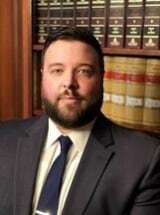 He is also the Court Liaison for the Connecticut Criminal Defense League Association for Litchfield County as well as Co-Chair of the Criminal Law Society for the Litchfield County Bar Association. Attorney Salerno was active in the Student Bar Association during his studies at Touro Law Center and received multiple awards, including Exemplary Contributions to the Quality of Student life, Exceptional Contribution to the Growth of the Law Center, and Exceptional Service to the Public and Community. He was also a founding member of the Criminal Law Society and the Student Bar Association's Vice President in his last year of school.